I was recently at a friend’s home and he had a new HDTV. It was entirely too big for the room where he was viewing it and the closer I sat to the large screen the worse the picture appeared. Generally, 30-inch and smaller sets are great for bedrooms or guest rooms but too small for the main living room. Sets with bigger screens are large enough for the whole family to enjoy and will probably be too much for most small bedrooms. Remember that tube TVs are also fairly deep and get bulkier as the screen size increases. You’ll want to pick out a deep-enough spot for the TV so that it doesn’t protrude awkwardly into the room. Now, go forth and purchase a set that is right for your den and don’t let the large-size screens entice you into something you don’t need. 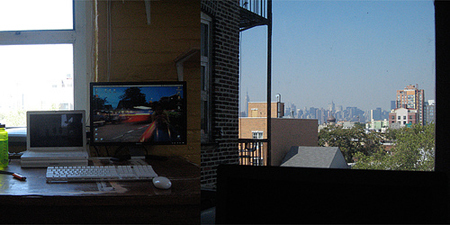 This week’s Workspace of the Week is Powkang’s student studio in NYC. She lives in her workspace, so it’s pretty impressive. Check out both sides of her apartment studio, which she’s annotated. What I really love is her inspirational view of Manhattan. It’s very cool that she keeps that view uncluttered. Here’s a great uncluttering tip for the kitchen. 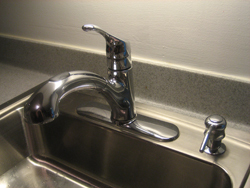 When my wife and I moved into our first house together, we had a plastic hand soap dispenser and a bottle of dish soap sitting next to our kitchen sink’s faucet. It was a messy and unattractive solution. I noticed that there was a covered cutout to the right of the faucet for a spray hose or a soap dispenser. I removed the cover and installed a basic chrome soap dispenser that mounts in the hole (similar to this one) We keep it filled with concentrated, hand-friendly dish soap. Now, whenever we need to hand-wash dishes, we pump soap directly into the sink. Whenever we need to wash out hands, we just use a tiny amount (since it’s concentrated). 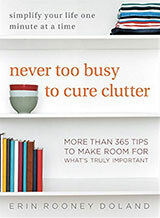 No mess and no clutter. Thank you for such a terrific suggestion, J. Todd! We do the exact same thing in our kitchen (as you can see in the photo accompanying this article), and it works extremely well because our faucet doubles as a spray hose. Cell Phones for Soldiers: Cell Phones for Soldiers hopes to turn old cell phones into more than 12 million minutes of prepaid calling cards for U.S. troops stationed overseas in 2007. To do so, Cell Phones for Soldiers expects to collect 15,000 cell phones each month through a network of more than 3,000 collection sites across the country. ReCellular: Wireless Recycling: An increasing number of Americans are using cell phones, discarding them frequently, and creating tons of solid waste even though most of the used cellular phones are still functional. ReCellular saw the opportunity to start a new industry and help protect the environment. ReCellular, Inc., was founded to refurbish, reuse and responsibly recycle discarded cell phones. American Cell Phone Drive: Donate or recycle your used cell phones through AmericanCellPhoneDrive.org, the largest, most comprehensive, cell phone drive in the world. Over 4,000 organizations are part of AmericanCellPhoneDrive.org. Choose the organization you would like to donate or recycle your used cell phones through in your local community by going to AmericanCellPhoneDrive.org. Get rid of your old cell phone clutter and do something charitable in the process! When a reader suggested that we review a store in New York City that caters to space-saving customers, we gave a Manhattan writer a call to see if she could help us. Everyone welcome Ayn-Monique Tetreault-Rooney to the Unclutterer review crew! Don’t live in a McMansion? Check out Tiny Living for ideas and products to maximize your minimal space. 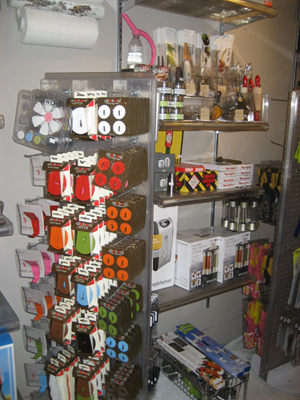 This appropriately small New York store (it’s only about 10′ wide and 20′ deep) carries all sorts of things to keep your home and office neat and tidy. The well-chosen selection includes objects that are either smaller than usual or multifunctional. Saving space in the kitchen? Opt for a combo coffee-maker and toaster oven. 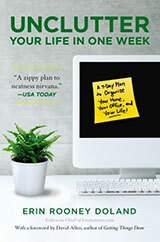 Getting your finances in order? A mini-calculator magnetic clip will keep your bills in view (and make splitting shared statements a breeze). Bestsellers include salt and pepper mills with grinders shaped like bunny ears and hanging purse racks in on-trend patterns and colors. Don’t worry if you can’t get to the Big Apple to shop–this two-year-old store has a large inventory on its website and is adding things by the week. It even offers a few things online, like modern desks and clean-lined loveseats, that just don’t fit into the brick-and-morter outlet. Tiny Living is worth a visit if you’re in need of outfitting your home or office with space-saving items. Eating chicken wings can be a messy business, but it doesn’t have to be. The SnacDaddy wing tray is the innovative new tray specially engineered to hold chicken wings and hide the leftover bones. 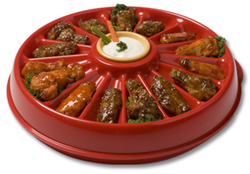 Apparently, using two dinner plates (one for the uneaten wings and one for the leftover bones) is not a good serving idea because the plates aren’t “engineered to hold chicken wings” the way SnacDaddy is. See, with the SnacDaddy, you pick up a wing, dip it in the sauce, eat the wing, move the sauce, put the bone in the sauce hole, and then replace the sauce. It’s so easy! This device also has the capacity to hold 15 wings at a time! My dinner plates can handle 25 to 30, which must be way too many at a time for a hungry crowd. How did we get along without the SnacDaddy before now? On a pseudo serious note, I can actually see how the SnacDaddy would be a good product for use in a sports bar or restaurant that regularly serves chicken wings. As a former food service worker, I could see how the hidden bones would make clearing a table a more pleasant experience. However, with its 13″ diameter and 4″ depth, Ann and John are correct in suggesting that it’s serious overkill and clutter for your home. I’ve read in numerous organization books the suggestion of covering an end table with a table skirt so that you can hide things under the table (your child’s toys, active knitting projects, etc.). Table skirts don’t really mesh with my design style, but I can see that this suggestion would work for people whose style it complements. Table cloths for use on dining room tables are a completely different monster, however. Most people don’t hide objects under their dining room tables because that is where human legs belong, so a table cloth isn’t being used to hide clutter. If you’re worried about your table getting damaged by heavy objects, a flimsy layer of cotton isn’t going to protect the wood. It makes more sense to have a piece of glass or clear plexiglas cut to fit your tabletop to better protect its surface. Plus, a piece of glass or clear plexiglas will let you see your table instead of hiding what you likely spent hundreds (maybe thousands) of dollars to purchase. Table cloths have to be stored when not in use, need to be washed after a single meal, and often have to be ironed to look their best. All of these steps and necessary storage space can be eliminated by not having them at all. If you like the look of a decorated table, buy Chilewich table mats that have a sophisticated appearance and wipe clean with a sponge. They don’t require ironing or a spin through the washer and dryer after each use. 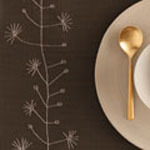 Plus, a stack of 20 table mats takes up the same amount of storage space as a single table cloth. Combine the table mats with a glass or clear plexiglas covering, and you’re on your way to an uncluttered and easily maintained dining room table! With $100 price tag, I imagine that a homemade version would be kinder on the pocketbook. Plus, the self-cleaning litter box that I use wouldn’t fit inside this cabinet. It is, however, wonderful inspiration for those of us with cats! When you move you usually spend a bunch of time tracking down boxes to transport all of your stuff. My wife and I have hit up grocery stores and other local retailers for boxes that they would otherwise crush and throw away. U-Haul offers a box exchange resource for prospective movers. It is a simple forum that is split up geographically to help you trade new or used boxes. So rather than running around to retailers you can check the forums for your area and see if there are any boxes available in your vicinity. After you move, rather than throwing away your boxes, you can post a message to the board and give them to someone who can use them again. If you can’t find boxes via the U-Haul forums, you can also try FreeCycle, an Unclutterer favorite. Cords and chargers for electronic devices are a constant discussion point at the Unclutterer offices, in the reader comments, and through our contact page. I think it’s safe to say that cords are a frustrating source of clutter for all of us. Recently, we’ve had a slew of suggestions for containing cord clutter from our readers. After combing through them and doing some additional information gathering, I think the following suggestions are downright brilliant. And, as far as we can tell, these readers don’t work for the companies that make, distribute, or promote these products. 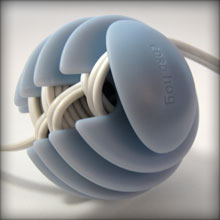 Reader Aegir suggests: The CableYoYo as another attractive cable spool system. Reader Beaman suggests: The KangaRooM Charging Station as a sleek way to hide the cords and docking stations for your cell phone, iPod, and other personal electronic devices. Reader Ian suggests: The PocketDock AV as a simple, clutter-free, multiple connector kit that allows you to link your iPod to numerous AV output devices (like televisions, stereos, and projectors) without having to carry a slew of cables with you. Do you have suggestions for containing cord clutter? Feel welcome to drop them into the comments section! Like I mentioned above, we’re always on the lookout for good ways to control cord and charger clutter. The researchers have found that subjects are quite accurate in their self assessments and that anyone who chooses picture #4 or above may be eligible for hoarding studies and/or treatment. Which brings me to the story of a 90 year old man who was rescued from his mountain of clutter in Norton, MA. Local residents were very aware of all the junk in his yard, but had no idea how bad it was inside the elderly man’s home. After someone called authorities Friday concerned that Halko had not been seen for a couple of days, an ambulance responded. It took paramedics more than 10 minutes to locate him amid the piles of furniture, boxes, magazines, appliances, and trash that he’d accumulated over several decades. Be aware that hoarding usually takes a hold of an individual when they reach middle age and progressively gets worse. By the time a person reaches their golden years hoarding may consume their whole life and my become a danger to themselves and others. The researchers from the Boston University/Smith College study estimate that 1 to 2 percent of adults suffer from a hoarding disorder. I’m a big fan of Mark Bittman’s food column in The New York Times. His column is titled “The Minimalist,” so it’s difficult for an unclutterer not to be an avid supporter. I haven’t linked to any of his pieces before because The New York Times has had pay-to-access archives and columns that made links pointless. (Hey! Pay $5 to look at this column! Just kidding!) The announcement on Tuesday that the paper will no longer charge to access any part of its website changed that frustrating situation. Now, we can link to Bittman’s and other writers’ columns knowing that all of our readers will be able to see the text. Hooray! The article I’ve been longing to link to since July 18 is Bittman’s “101 Summer Express: Simple Meals Ready in 10 Minutes of Less.” Uncluttered, simple cooking is my kind of cooking. Enjoy the links. Additionally, this might be another opportunity for me to offer up the advice to cancel your daily print newspaper subscription to our New York City readers. Also, let us know in the comments if you find other uncluttering articles in the archives that we may have missed!